The sprites and background were made for the print, but they fit in with the classic Street Fighter Alpha/Marvel vs. scale. Joker's pose is based on that classic Carmine Infantino picture, but at a different angle. 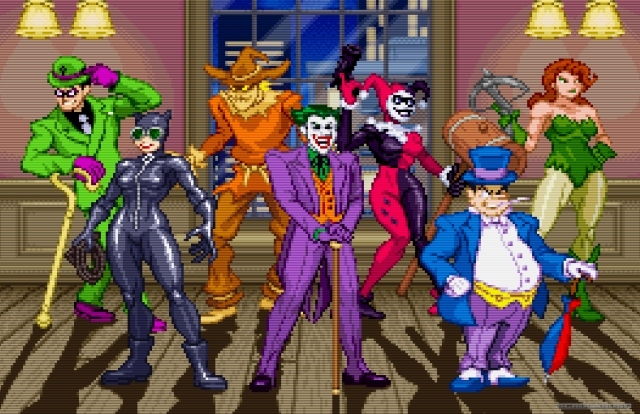 There was a point when I was going to swap Catwoman with Mr. Freeze (because she's not a 100% villain most of the time), but kept her in anyway. 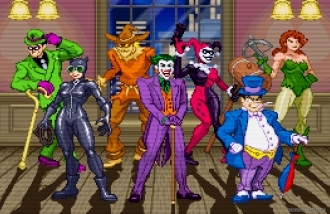 The original version had the Riddler in his original outfit, but I decided to replace him with the suit version that fits in with the rest of the crooks. Parts of the background are on things I found in quick image searches for 40's gangster movies, but the big window is based on pic drawn for Batman: the Animated Series.